Straight-sided candles, made with beeswax which gives a natural ivory colour and a slow burning time. Non-drip. Available in a variety of lengths and pack sizes. Church Candles 12" x 1" Pack of 24 is published by Charles Farris and is our 567th best seller. The ISBN for Church Candles 12" x 1" Pack of 24 is CC-04C. 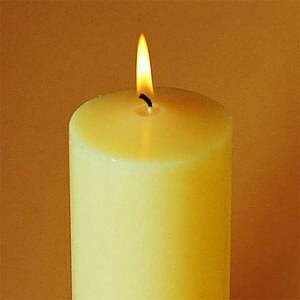 Be the first to review Church Candles 12" x 1" Pack of 24! Got a question? No problem! Just click here to ask us about Church Candles 12" x 1" Pack of 24. Hello do these candles come in the above size? I can't find them on your website? Thank you. A:I'm afraid we do not have 12" x 1 1/8. Just the above 12" x 1" and 12" x 1 1/4" (https://www.eden.co.uk/shop/church-candles-12-x-1-4-4331721.html). Thank you for using the Q&A Forum. Hi there, I was just wondering if these candles are just one colour of wax through out the candle. Because when i bought some other candles it seemed that the inside of the candle was made of a lighter wax and wasn't very good. I was just wondering if it is the same wax through out the product. Is there an equivalent in red please? Is this candle made with 25% beeswax? A:These candles do have a beeswax content but it is not as high as 25%. Are these candles fluted at the bottom or flat? A:The Church Candles are flat the bottom rather than fluted.